How many times has The Legal Genealogist said it? To understand the records we have to understand the law… and not in general but the law of the exact time when the record was created and in the exact place where the record was created. 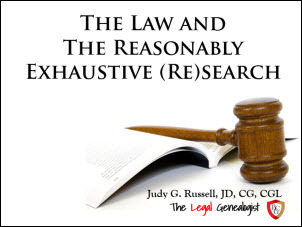 The other and equally important theme: there’s a difference between searching and researching, and understanding how the law impacts records and research is critical to the reasonably exhaustive research needed to meet the Genealogical Proof Standard. So come on out tonight and join me and BCG and learn how the law impacts records—and how finding the right law for the right place and time is critical to doing genealogy right. I really enjoyed your webinar about “law and (re)search” two nights ago. I’m from Québec and have been researching for years my Black ancestor who seems to have magically appeared in Gaspé, Québec in 1832. Napoleonic Code prevailed then, as you pointed out, and before that the Custom of Paris. Since I’ve found precious little on my ancestor’s origins until now, I realized I need to dig into the the notary’s records. The points you brought up in your webinar made it clear that I need to learn more about those laws so I can better interpret what I will find. I realized how little I know as I heard the information you provided us with. So thank you for that, and I will use it as a jump-off to get me going into the legal part of my continued research.